Be the first to share your favorite memory, photo or story of Lenore. This memorial page is dedicated for family, friends and future generations to celebrate the life of their loved one. Lenore May Rasmussen, 97, daughter of Lewis Alvin & Clara Leota (McClellan) Halterman, was born January 23, 1921 near Bayard, Iowa. She passed away Thursday, October 18, 2018 at the Guthrie County Hospital, Guthrie Center, Iowa. She graduated from Bayard High School in 1938 and enjoyed playing 4 years of 6 on 6 girl’s basketball. She grew up in and around Bayard working at Nita’s Café and Vaux grocery store. She worked in a café in Guthrie Center where she met her future husband, George Rasmussen. They were married November 30, 1941 in Missouri. Three children were born to this union; Marilyn, Ken, and Kathy. George entered the army in July 1942 going to Camp Carson, Colorado where Lenore and Marilyn joined him until he went overseas. She lived in Guthrie Center until his return in October 1945. They farmed in the Wichita area for over 25 years. They retired and moved to Guthrie Center in 1979. She worked at Cronk’s Café & Beaches Store and was an office clerk at the Guthrie County Hospital 8 years before retiring. She was active in community gatherings, card clubs, her church at Wichita and Guthrie Center and a volunteer for Meals on Wheels. 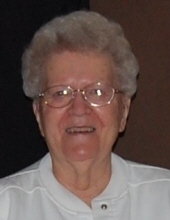 She was a 62 plus member of American Legion Auxiliary and Secretary/Treasurer of Past President of Legion Auxiliary. Lenore was an avid sports fan especially watching her Chicago Cubs. She attended all the activities that her kids were involved in. She loved to travel with the Heritage Club & saw many interesting things. She and Marilyn traveled a great potion of the United States, going to George’s army reunion each September where she met many interesting people. Lenore is survived by her son, Ken (Joline) Rasmussen of Guthrie Center; grandsons, Tim (Cindy) Gardiner of Fountain, CO; Tyler (Caitlyn) Gardiner of Stuart, IA; Joseph Rasmussen of Bloomfield, IA; and granddaughter, Amanda Rasmussen (Brandon Schade) of Des Moines, IA; and two great-granddaughters in Fountain, CO. Her brother, Alvin (Wilma) Halterman of Papillion, NE; and many nieces, nephews, and a host of extended family of cousins. She was preceded in death by her parents, husband George, daughters Marilyn Rasmussen and Kathy Gardiner, infant granddaughter Tracy; brothers Gerald (Edythe) Halterman and Wayne (Helen) Halterman; and her sisters-in-law Delia Benton (98) and Elva Rasmussen (94) passed away this year as well. Funeral services will be 10:30 A.M., Monday, October 22, 2018 at the First United Methodist Church, Guthrie Center. Burial will be in the Seeley Township Cemetery, Guthrie Center. Visitation will be Sunday, October 21, 2018 from 4-6 P.M. at the Twigg Funeral Home, Guthrie Center. In lieu of flowers, memorials may be left to the Guthrie County Relay for Life or the Guthrie County Hospital. To send flowers or a remembrance gift to the family of Lenore May Rasmussen, please visit our Tribute Store. "Email Address" would like to share the life celebration of Lenore May Rasmussen. Click on the "link" to go to share a favorite memory or leave a condolence message for the family.